For years, factions of the internet have been engaged in a lively and thoughtful debate about the effects of printing on the environment. Some counter that digital reading, billing, and advertising is better for the health of the planet, as it does not involve the consumption of trees. On the other hand, internet-based communication is itself problematic, as the technology needs an enormous amount of energy to function. 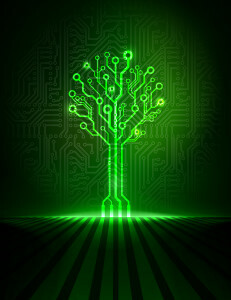 There are benefits and downsides to each form of media, as neither one is inherently more eco-friendly than the other. Responsible printing involves listening to both sides of the conversation. One way to compare these methods of communication is by looking at the time we spend reading. According to a study by the KTH Center for Communications, the amount of time you spend reading the news determines your environmental footprint. If it takes you 10 minutes or less to catch up on current events, it’s more energy efficient to read on the computer. However, if you spend 30 minutes or more each day on the news, print sources are more sustainable. Another statistic from the same survey shows that each e-reader produced consumes as much water, energy, and raw materials that it takes to make 40 to 50 books. Therefore, the sustainability of the options varies on individual reading pace. To many consumers who are concerned about the environment, printing companies seem like an obvious, major cause of deforestation. This is largely a misconception, as only 11% of the world’s timber is used by the paper industry. Furthermore, laws like the Lacey Act set guidelines to ensure the responsibilities of US printing companies. Regulations for digital media are less developed, since the technology is newer. According to a 2013 study by the Digital Power Group, the digital economy accounts for approximately 10% of the world’s total energy consumption. That’s equivalent to the total amount of energy used by Germany and Japan together. The same amount of energy (1,500 terawatt hours a year) was able to light the entire planet in 1985. At Springfield Printing Corporation, we endeavor to print in the best way for our environment. That’s how we earned our Forest Stewardship Council Certification. By using vegetable-based inks and water-based aqueous coatings, and recycling as much as possible (387,035 lbs. of paper and 4.7 tons of aluminum printing plates in 2013), we print media our clients can feel good about.